Medicare for All? Even Medicaid expansion is unlikely, Florida Legislature says. The Democratic nominee for governor, Andrew Gillum, has run on two policies that would greatly expand access to health care. But Tallahassee leaders say there's no chance of them passing. Even if Democrats take back the governor's mansion, don't expect Medicaid expansion — let alone Medicare for all — in Florida any time soon. That's the message from leaders of the Florida Legislature as the governor's race between Democrat Andrew Gillum and Republican Ron DeSantis inches toward its November conclusion. "I do not believe there is support in the Legislature for the expansion of Medicaid contemplated in the Affordable Care Act," incoming Senate President Bill Galvano, R-Bradenton said in a Wednesday statement to the Times/Herald. Jason Brodeur, who chairs the Florida House Health Care Appropriations subcommittee, said he also doesn't expect his chamber to vote to expand the program. "That issue is settled," Brodeur said in an interview, "Unless (Gillum) has plans to overtake the House and the Senate and get them all to vote opposite of what we did a few months ago." José Oliva, the incoming Republican speaker of the Florida House, did not respond to requests for comment. The statements from Tallahassee leaders come during a time when health care is on the minds of many voters. A September survey from the Kaiser Family Foundation that health care is the second-most important issue to midterm voters, behind only corruption in Washington, D.C.
Democrats hope to seize on the activist energy around the issue, holding rallies in Florida and spotlighting what they say are Republican efforts to deny access to coverage from vulnerable Americans. Those efforts have, at times, centered around Medicaid, which varies from state to state but largely covers those who are too poor or sick to afford health insurance. Joan Alker, a research professor who runs Georgetown University's Center for Children and Families, said the program is more popular now than it was under President Obama, who worked to expand it. For example, Alker said one of the reasons Republicans failed to pass in the summer of 2017 its own American Health Care Act, which would have repealed Obama's Affordable Care Act, was because of the public outrage over the deep Medicaid cuts in that bill. "Medicaid expansion is a winning issue for candidates," Alker said, noting that according to her research, even states run by Republicans that have expanded Medicaid have seen improved health outcomes. But DeSantis, who voted for the Republicans' American Health Care Act in 2017, said in a Wednesday email that the best way to give customers greater access to affordable health care would be to improve the economy so everyone can get a good plan through their employer or on the open market. "Expanding Medicaid," DeSantis said, "would extend to able-bodied adults. That's not what Medicaid was designed for, that's not what taxpayers pay for, and that's not how healthcare or government should work." For Gillum's part, Democrats are highly unlikely to win back both chambers of the Florida Legislature in 2018. At best, they have an outside chance to take back the Senate. And the Florida governor does not act alone to create policy. If Republican legislators are not willing to work with a Democratic governor, Floridians won't see Medicaid expansion no matter how hard Gillum campaigns on it. 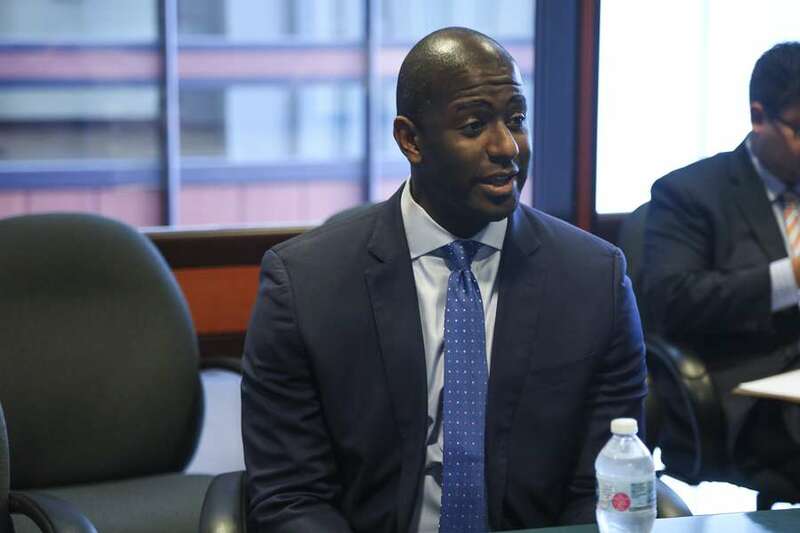 In an interview Wednesday, Gillum expressed confidence that his veto power as governor would be enough to ensure a "negotiation" with lawmakers, and that he is hopeful about the Democratic balance in the Senate. Medicaid expansion is the more moderate of the two core health care policies Gillum has backed. The Tallahassee mayor also supports Medicare for all, which DeSantis has criticized, in part because of its high price tag. There are ways for a governor to work to expand access to Floridians short of Medicaid expansion or Medicare for all, Alker said. Florida's Medicaid program, which is run by the state with a combination of state and federal funding, largely insures Floridians with the help of health insurance companies in managed care plans. Citing a 2016 study, Alker said the state government could do more to ensure that those plans are providing Floridians robust access to coverage. DeSantis said although the managed care plans have been a "success" for Florida, there is room for improvement. "We need to expand alternatives like direct primary care, telemedicine, and making sure we have a robust hospital system so that when people are in critical need, they can get the best care," DeSantis said in an email.